There are many things to consider when remodeling a kitchen. Budget, design, and functionality are the most common. Kitchen remodels typically yield a return on investment (ROI) between 65%-90%. Mid-range remodels, such as refacing existing surfaces, typically yield 65% ROI. A major kitchen remodel could yield 90% ROI or more. When determining your budget, consider the following: How long will I live here? What is my total budget, and will other areas of the home require remodeling to create balance? Is my budget comfortable enough that I won’t have to settle for materials and fixtures that I won’t be happy with in the long run? Hiring a designer is a wonderful way to get help putting your ideas into a cohesive plan and pointing out aspects of your kitchen to consider with your remodel that may not have crossed your mind. Is there a divider wall that separates your kitchen from living areas? Is the current placement of appliances functional? What do you wish you could do with the space that you can’t do today? Kitchens are the heart of most homes. Having an inviting space where family and friends can comfortably gather might be your ultimate goal. One of our homeowners took on some of the designing aspects themselves and let us assist in some not-so-common design considerations. The divider wall between the kitchen and living area caused a level of separation that the homeowner did not like. Additionally, the existing countertop that curved to an island and provided counter seating accessible only to the dining area was dark and unusable. The outdated cabinets were short, with a header above the cabinets that closed in an already cramped space. Fluorescent bar lighting was less than desirable. The solution was to remove the divider wall, push the curved island to the back wall, and add a freestanding island between the kitchen and living area. This created a bright and open space. The placement of the island was important as to not impede into the living area, but still allow enough space to keep the kitchen and dining areas functional. The minimum distance from counter to island is 36”. With the combined kitchen and living space in this layout, I recommended 46”, which allowed the seating at the living room side of the island to stay within the kitchen area, keeping the primary walkway clear. Lighting was added as well, desiring recessed can lights and two island pendants over the previous fluorescent lighting. A French door style refrigerator was suggested as side-by-side refrigerators have a greater opening radius than French door refrigerators and can open into neighboring cabinets. The custom built and stained shelving between the cabinets compliments the subway tile and provides a space for displaying unique items. After! Functional, inviting, and trendy! Overall, the style is on trend while remaining classic. Over time, the look of the kitchen can be changed without a complete remodel. With a well-designed layout, a future remodel could consist of changing out lighting, custom shelving, and the backsplash to give the area a completely different look. 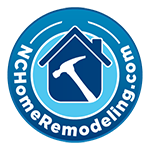 NCHomeRemodeling.com offers free estimates as you consider your home remodeling projects. We service Raleigh, NC and surrounding areas. No Replies to "Updating a 1980's Kitchen"